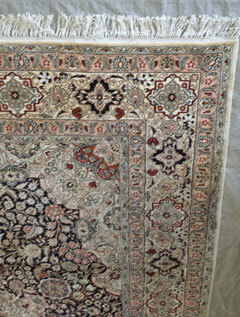 Welcome to Oriental Rugs Specialist, San Diego County's best source for Oriental rug cleaning, repair, and restoration services. In business since 1929, we have eight decades of experience our customers can count on and excel at maintaining and restoring a broad range of natural and synthetic fiber rugs and related textiles, including Afghanistan rugs, Belgium rugs, Bokhara rugs, Chinese rugs, Couristan rugs, Flokati rugs, Indian rugs, Karastan rugs, Kilim Moroccan rugs, Navajo rugs, Pakistani rugs, Persian rugs, Sisal rugs, Stark rugs, Turkish rugs, and more. We never use harsh chemicals or abrasive scrubbing machines; instead, we carefully and thoroughly hand clean every rug that enters our facility. Additionally, we are highly skilled at complete rug repair and restoration, which includes everything from dye touch-ups to refringing to hole repair. We stand behind all of our work with a 100% satisfaction guarantee and tag each rug during transit for security purposes. By providing quality workmanship with personalized service, competitive prices, and free pickup and delivery, we have earned a stellar reputation for value among our customers in San Diego County and beyond. 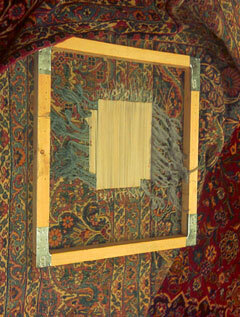 At Oriental Rugs Specialist, we always take the time to safeguard the integrity of each Oriental rug's fibers and dyes. 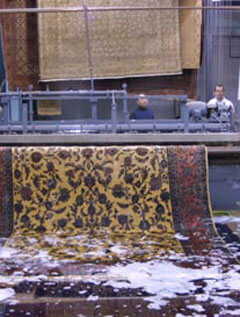 We carefully inspect each rug before treating it and rely on our family's time-tested hand cleaning approach. By using compressed air to remove dirt, grit, sand, and dust, and then submerging the rug in a series of baths for decontamination, hand washing, and rinsing, we effectively disinfect, sanitize, and clean it. This process is also ideal for removing pet urine stains, food stains, wine stains, mold, mildew, smoke odors, and other substances from antique, semi-antique, and new Oriental rugs. After the rug cleaning process is complete, our team of master weavers will address any rug damage caused by time, moth infestations, chemicals, pets, improper care, or high pH cleansers. With an average of 35 years of experience, they are experts in rug reshaping, rug reweaving, color bleed correction, edge-work blocking, edge binding, re-dying, patching, sleeve casing repair, and many other rug repair and restoration services. To learn more about our San Diego Oriental rug cleaning, repair, and restoration services, give us a call today. We are available seven days a week and offer free estimates throughout San Diego County, including Oceanside, Carlsbad, Vista, Encinitas, Del Mar, Solana Beach, and other North County cities. 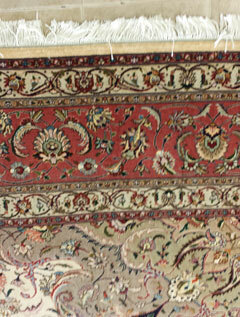 Ask us about our 20% discount on rug repairs and restoration work for large Oriental rugs and tapestries.